Eleven-year-old Dade City boy Quinn Ignatowicz just shattered an academic record at Pasco-Hernandez State College. DADE CITY, Fla. — Quinn Ignatowicz is one amazing student. The 11-year-old Dade City wunderkind just shattered an academic record at Pasco-Hernando State College. 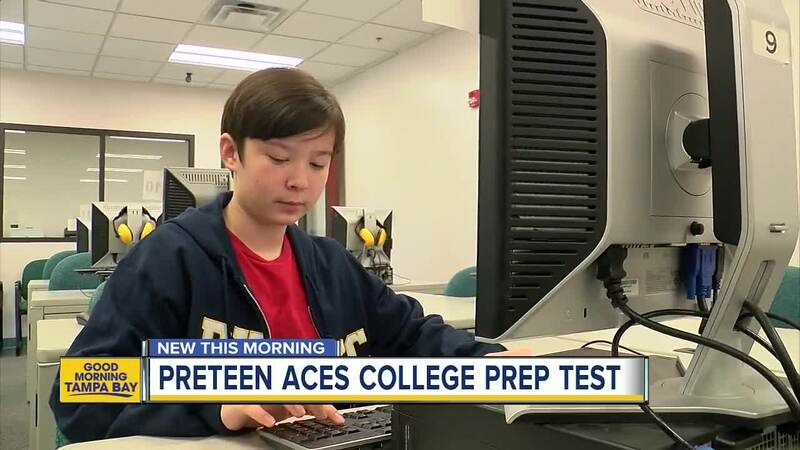 In a testing center at the school’s Dade City campus, Quinn joined his father and older brother in taking the College Level Examination Program, which is better known as the CLEP test. If you pass the CLEP, which costs just $87 to take, you can earn inexpensive credits to most major colleges, including USF and the University of Florida. It is a great deal that a lot of students do not know about. Of course, you have to pass. And a lot of kids much older than Quinn struggle with the CLEP. “I was anxious going in because everyone else that did it was older than me and I didn’t know how I was going to do,” says Quinn. Michael Childs, who monitors academic success at Pasco-Hernando State College, says not only did Quinn pass the CLEP, he put up a big, albeit confidential, score. “This is my first experience with someone so young passing one of these tests,” says Childs. Quinn’s father Lance says his youngest son is normally a solid, but not spectacular, student. But Quinn is also “a businessman.” So his father offered up $100 to which of his sons scored highest on the CLEP. More motivation? Quinn says he also wanted bragging rights on his older brother. “When he’s insulting me, I’m like, well, who got a better grade on the test?” said Quinn. Quinn wants to go to USF one day. And now, he already has credits there. For more information on the CLEP, visit clep.collegeboard.org/content/pphome .